Today, Georgia Southern University broke ground on the new Military Science building. In April 2014, Georgia Gov. Nathan Deal approved the state budget, which included $9.5 million in funding to Georgia Southern University. 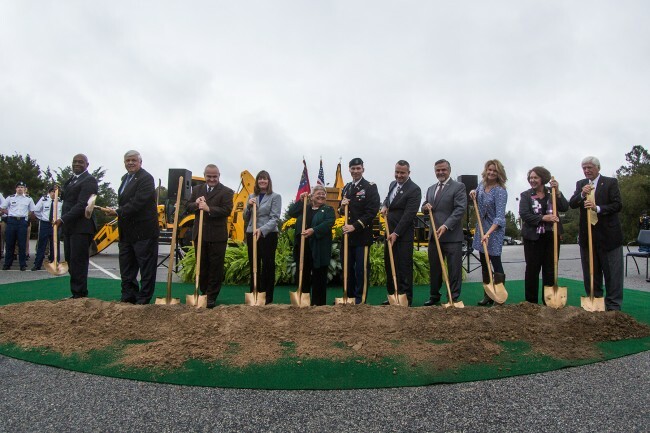 The funding was allocated to build a new Military Science building, scheduled to open in Fall 2016. “We are grateful to the Governor and our legislators whose work moved us forward in a very positive way to secure the funding for this building,” said Bartels. Present at the ceremony were Georgia state Senator Jack Hill, R-Reidsville; Representative Butch Parrish, R-Swainsboro; state Representative Jan Tankersley, R-Brooklet; Regent Lori Durden; and Colonel Jeffrey Edge, Georgia National Guard, among others. “Because of the efforts of those involved in the project, we will now have a world-class facility at Georgia Southern for our cadets to enjoy and to better aid in their development,” added LTC Erik Kjonnerod, professor of Military Science at Georgia Southern. The new 32,000-square-foot building replaces the space the Eagle Battalion ROTC program has occupied for nearly a decade. The new building, located on campus at the corner of Forest Drive and Old Register Road, will consist of a large auditorium, meeting rooms, classrooms, storage space and faculty and administrative offices. “Everyone here is excited and cannot wait to step foot in our future Military Science building,” said Kjonnerod. Georgia Southern University, a public Carnegie Doctoral/Research University founded in 1906, offers more than 125 degree programs serving more than 20,500 students. Through eight colleges, the University offers bachelor’s, master’s and doctoral degree programs built on more than a century of academic achievement. Georgia Southern is recognized for its student-centered and hands-on approach to education. Visit GeorgiaSouthern.edu.